Have a book in the works? A memoir you need help organizing? Searching for feedback on your latest short story? Come join our monthly workshop. We meet for approximately two to three hours one Friday each month. In addition to feedback from our peers, I offer comments and take your latest chapter, story etc. home for review. We offer a lot of support and advice on how to move forward and will take your project to its well-written completion. I am capping the class at 6 to 8 students on a first-come, first-serve basis. AVA Gallery, Lebanon, NH, March 9, 9:00 a.m. to 2:00 p.m.
Use a photo of your choice for a prompt for four separate stories. Get your creative juices flowing and spark your memories in this fun and stimulating workshop. Launch or jumpstart a memoir, a new journal, or create an archive for family and friends. This class is open to all levels. Come with a spirit of fun and a willingness to share and please bring photos! Writer's Center, WRJ, Vt, January 31st for 8 weeks, 6:00 p.m. to 9:00 p.m.
Have a story you've been trying to tell? Whether you are a beginner or a pro, we all need a little help to get that story started and figure out its structure. 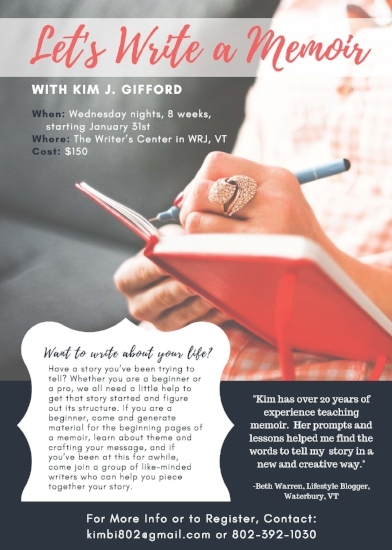 If you are a beginner, come and generate material for the beginning pages of a memoir, learn about theme and crafting your message, and if you've been at this for for awhile, come join a group of like-minded writers who can help you piece together your story. AVA Gallery and Art Center, March 10th, 10:00 a.m. to 4:00 p.m. Lift up snippets of lyrics and photos as writing prompts to spark memories and generate stories. Students will enjoy ample writing and sharing time and leave with a wealth of writing and ideas to take home. Please bring an object of memorabilia and come with pen and paper, a spirit of fun, and a willingness to share.